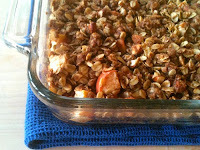 For directions how to make vegan apple crisp see the tip at the bottom of the recipe. For apple filling, in large bowl combine apples and maple syrup. Sprinkle with 1/2 teaspoon cinnamon; stir to coat. Place apple mixture in 2-quart square baking dish. For topping, in medium bowl combine oats, flour, brown sugar, almonds, 3/4 teaspoon cinnamon and ginger. Add melted butter; stir until crumbly. Sprinkle topping over apples. Bake in a 375 degree oven for 30 to 35 minutes until apples are tender and topping is browned. Serve warm or cooled. Tip: To make vegan apple crisp, use 1/4 cup vegan vegetable oil spread in place of the butter. Another vegan option is to use 3 tablespoons melted coconut oil and 1 tablespoon soymilk in place of the butter.